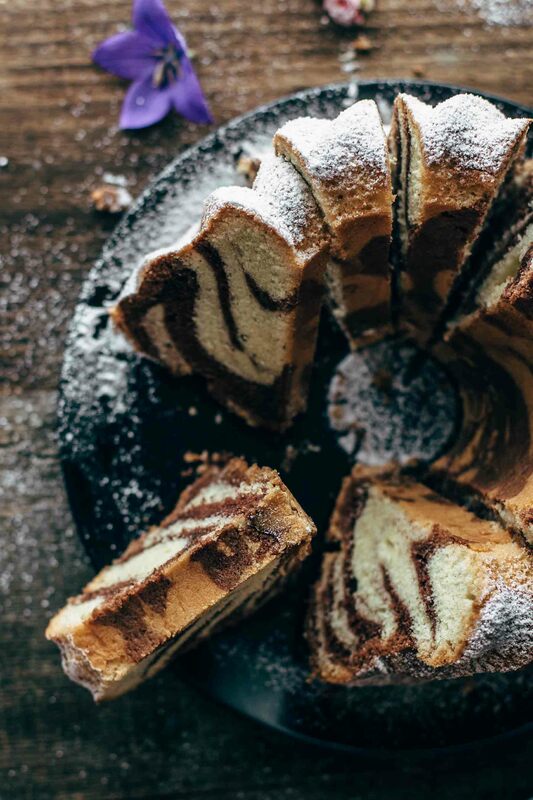 This Austrian Marbled Bundt Cake is a traditional Austrian cake. It is super delicious, fluffy, and tastes like vanilla and cocoa. You know how much I love American food and baking. This is the reason why 90% + of my baking recipes are American. But sometimes I love to bake some traditional European recipes. It’s time to show you another European classic. 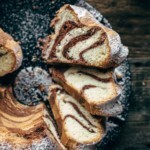 Today I show you this Austrian Marbled Bundt Cake which is a very traditional and popular Austrian cake. You know apple strudel? Well, this Marbled Bundt Cake is as popular as apple strudel here in Austria. The German word for it is Marmorguglhupf. I’m sure you are laughing now. It is a very funny word, I know. 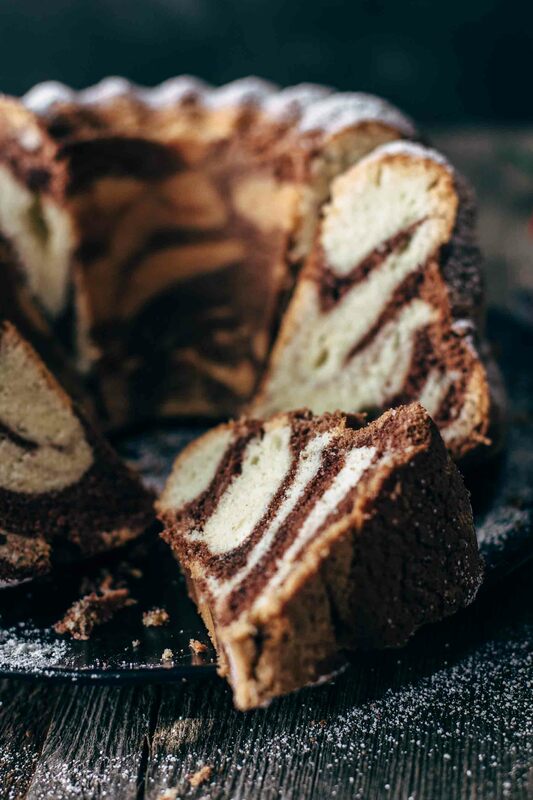 This Marbled Bundt Cake is one of the few Austrian baking recipes I really love. It is different than American bundt cakes. American bundt cakes are more dense and moist. 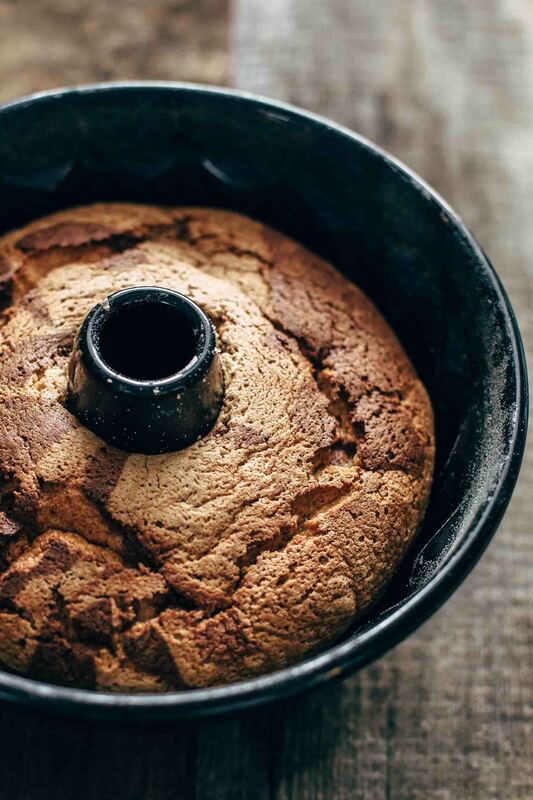 This Austrian Marbled Bundt Cake is not dense at all. It is more like a sponge cake or angel food cake from the texture. It is airy, light, and lightly sweet with a strong taste of cocoa and vanilla. The upside is that it is super easy and quick to make. The downside is that there is no downside at all. When you call “I can’t stop myself eating the whole cake at once” a downside, then ok, this is the downside. If you haven’t had this delicious cake before, we need to change this immediately. I strongly recommend baking this amazing Marbled Bundt Cake as soon as possible that you no longer have to miss it in your life. Like many Austrian or German baking recipes, this Marbled Bundt Cake calls for separating the egg yolks and the egg whites before mixing. Beat egg yolks with sugar until pale and creamy. Stir in vanilla, then slowly mix in oil. Then alternately add dry ingredients and water. Maybe you are wondering because of the water. The most American bundt cake recipes call for milk or buttermilk as a liquid. It is very common to add water to the baking goods here in Austria, rather than milk and buttermilk. 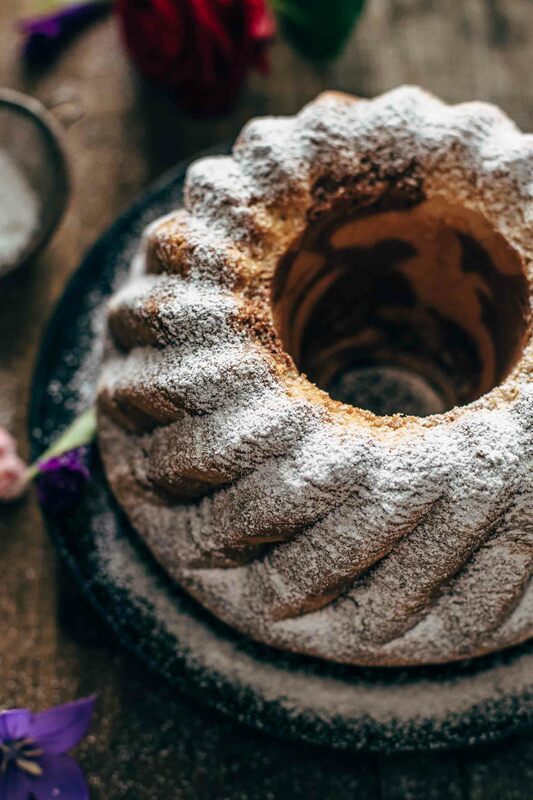 Of course, I could have tried to add some milk or buttermilk instead, and I guess this would have been delicious, but it wouldn’t be an original Austrian Marbled Bundt Cake anymore. I’m sure the texture would be completely different, more dense and moist. In another mixing bowl beat egg whites until soft peaks form. Add sugar and beat until stiff peaks form. Gently fold egg whites into egg yolks. The consistency of the batter is fluffy and airy. Then divide batter into 2 bowls equally. Take one bowl and fold in cocoa. You have now a dark and bright batter. Alternately spoon the bright and the dark batter into a 10-inch bundt pan. The bundt pan 9.5 inches (24cm) to be exact. Big enough to hold 10-12 cups. The bundt pan should be lightly greased and floured. Make sure that you grease and flour the pan very lightly. I made the experience that the more I grease and flour the pan the more uneven the surface of this Marbled Bundt Cake looks like. But it doesn’t make a difference to the taste or the texture of the bundt cake. The more you grease and flour it can look kind of wrinkly on the surface. Or let’s stay with uneven. If this does happen to you, don’t worry. It is normal to dust the Marbled Bundt Cake with powdered sugar anyway. So nobody will see it in the end. And be honest. Who looks at the outside when the inside is so beautiful? It looks like a kind of zebra cake. You see that? Keep in mind that you have full control over the marbleization. Depending on how you add the two batters to the pan it has a huge impact on the marbleization. When you pour it alternately into the pan, it will look different than spooning it alternately into the pan. I spooned it alternately into the pan to get a smaller marbleization. 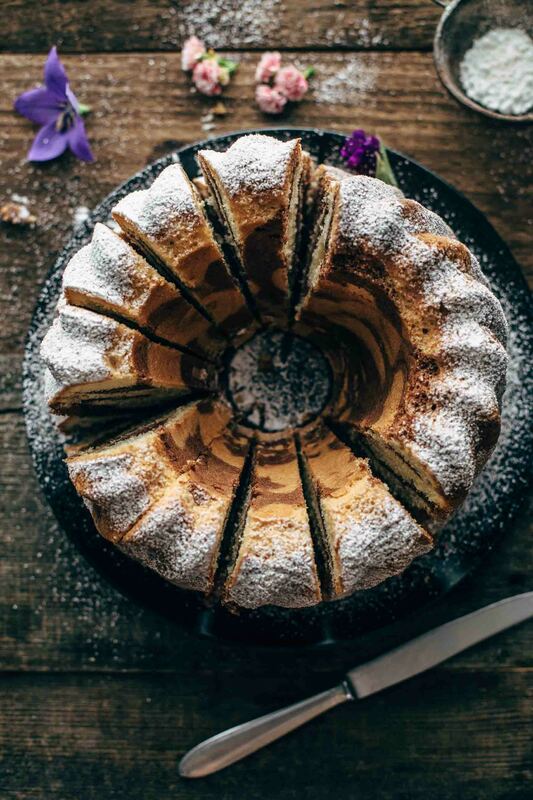 With this traditional Austrian Marbled Bundt Cake, you are going to impress your family and friends. It’s like a trip into the heart of Europe without leaving the kitchen. 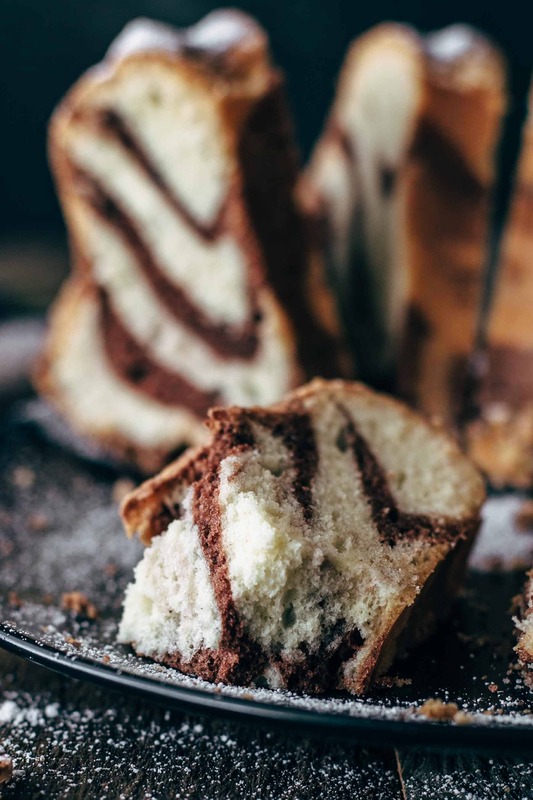 If you make this Austrian Marbled Bundt Cake recipe leave a comment, rate it and tag a photo #alsothecrumbsplease on Instagram! Would love to see your snap! 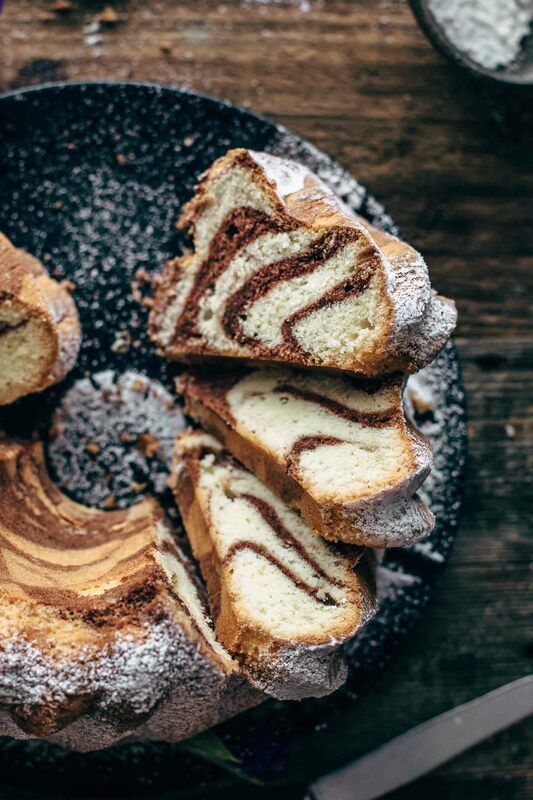 This Austrian Marbled Bundt Cake is a traditional Austrian cake. It is super delicious, airy, and tastes like vanilla and cocoa. Preheat oven to 320°F / 160°C. Lightly grease and flour a 10-inch (24cm) bundt pan. Set aside. In a small bowl stir cocoa and 3 tbsp water to combine. Set aside. In a medium-sized bowl, stir flour, baking powder, and salt to combine. Set aside. Separate egg yolks and egg whites into two large mixing bowls. With a handheld or stand mixer fitted with a whisk attachment whisk yolks with 3/4 cup of sugar on medium speed until creamy and the sugar is completely dissolved, about 2-3 minutes. Add vanilla* and stir to combine. Turn the speed down to low and slowly add oil. Then alternately add dry ingredients and 1/2 cup water and stir just until combined. Begin and end with dry ingredients. Set aside. With a handheld or stand mixer fitted with a whisk attachment whisk egg whites until soft peaks form. Add 1/2 cup sugar and mix until stiff peaks form. Using a wooden spoon, gently fold egg whites into egg yolks. Divide batter into two bowls equally. Add cocoa to one of the two bowls and carefully fold in just until combined. Alternately spoon light and bright batter into prepared bundt pan. Bake for 60-65 minutes until the bundt cake bounces back to touch. Let cool in the bundt pan for 1 hour. Then invert the pan onto a wire rack and let cool completely. Store in an airtight container at room temperature for up to 3 days. I’m sorry that it was not your taste. Thank you so much for telling me that I had a mistake in the recipe card. What is in the video is correct. It’s 2 tbsp of cocoa. As I wrote in the blog post, Austrian bundt cakes are not moist or dense. They are rather dry but airy. It’s supposed to be dry. I’m happy that you liked it!